Preface. Chapter 1. Introduction. Science and reproducibility. Chaos. 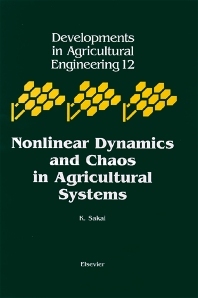 Studies of chaos on agricultural systems. Summary of the book. Chapter 2. Deterministic Chaos. Concepts of deterministic chaos. Deterministic dynamical system. May's deterministic chaos. Complexity produced by simplicity. Return map. Period doubling route to chaos. Bifurcation diagram. Feigenbaum number. Discrete dynamical systems. One-dimensional discrete system. Malthusian growth model. Logistic growth model. Self-similarity of the bifurcation structure. Other one-dimensional discrete dynamical systems. Two-dimensional discrete dynamical system. Competition between two species. Prey-predator relationship. Continuous dynamical systems. Chaos of Lorenz System. Lorenz equation. Lorenz attractor. Chaos of Duffing's Equation. Duffing's Equation. Ueda's Chaos Attractor. Chapter 3. Analysis of Chaotic Data. Chaos time-series analysis. Spectral analysis. Delay coordinate embedding. Correlation dimension. Deterministic nonlinear prediction. Reconstruction of dynamics. Concept of prediction. Practice of prediction. Response surface methodology. Return map. Hassell's analysis. RSM analysis. Chapter 4. Numerical Practice on Chaotic Population Dynamics in Plant Communities. Dynamics of a weed community. Life table of a weed community. Density dependence of weeds. Nonlinear dynamics in weed population. Linear dynamical system. Grass-litter dynamics. Chapter 5. Nonlinear Dynamics in Alternate Bearing and Masting of Tree Crops. Introduction. Models of masting and alternate bearing. Isagi's paradigm. Resource budget model. Simulated population dynamics. Two dimensional resource budget model. Reconstruction of dynamics by RSM. Applications to acorn data. Application to citrus dynamics. Controlling chaos and fruit thinning. One dimensional system. Two dimensional system. Formulation of OGY control on the reconstructed dynamics by RSM. Control without noise. Control when the stable point estimation involves errors. Conclusions. Chapter 6. Weed-Tillage Dynamics. Introduction. Basic concept of weed-tillage dynamics. The simplest model. The model incorporating field practice. The model incorporating density effect. Application. The k state variables model. Numerical experiments. Tillage transform parameters. Biological parameters. Results and discussions. Conclusions. Chapter 7. Chaotic Vibrations in Agricultural Machinery. Introduction. Chaos in a vibrating subsoiler. Materials and methods. Correlation dimension. Bifurcation when changing the forcing frequency. Periodic vibration. Period-doubling vibration. Chaotic vibration. Largest lyapunov exponents. Deterministic nonlinear prediction on the time-series of the acceleration. Theoretical investigations of nonlinear dynamics in a farm tractor. Mathematical model of bouncing tractor. Numerical simulations. Periodic vibration. Period doubling vibration. Quasi-periodic vibration. Chaotic vibration. Bifurcation structure. Experimental investigations of non-linear dynamics in a farm tractor. Experimental set up. Experimental bifurcation. Periodic vibrations. Quasi-periodic vibration. Period-doubling/chaotic vibrations. Nonlinear resonance. References. Chapter 8. Nonlinear Time Series Analysis in Piglet Pricing Data. Introduction. Dynamic model of agricultural commodities. Cob-web theorem. Larson's feedback model. Chaos time series analysis on pig cycle. Background of pork production in Japan. Trends of pig price and population. Deterministic nonlinear prediction. Modeling. Prediction. Conclusions. References. Chapter 9. Deterministic Nonlinear Prediction on Diurnal Change in Tangential Strain of Inner Bark for White Birch. Introduction. Experimental method. Spectral analysis of time-series data. Modeling of time-series data. Non-linear dynamic model without considering the external environment (Dynamic Model A). Non-linear dynamic model with consideration of the external environment (Dynamic Model B). Non-linear regression model incorporating temperature. Results of analysis. Results of reconstruction of dynamics. Deterministic nonlinear prediction. Dynamic model of stomatal oscillation and Hopf bifurcation. Conclusions. References. Chapter 10. Spatio-Temporal Dynamics in Arable Land. Introduction. Models of spatio-temporal dynamics. Spatially extended Lotka Volterra model. Coupled map lattice. Identification of locally coupled dynamics. Prediction. Conclusion. References. Chapter 11. Fractal of Arable Land. Fractal of the crop root system. Fractal dimensions of roots. Root system growth models. Fractal of soil pores. Fractal of the soil erosion network. Fractal of field surface irregularity. Conclusion. References. Appendix A. Numerical Analysis of Ordinary Differential Equations by the Runge-Kutta Method. Appendix B. Outline of the Neural Networks. This book provides an introduction to the analysis of chaos and chaos theory as it relates to agricultural science. With clear explanations of chaos theory and principles, the first part of the book offers some basic facts, the fundamental terminology, and the concepts of deterministic chaos. The second part of this volume contains rich applications of the theory as applied to real agricultural systems. Applications include a wide area such as alternate bearing in tree crops, weed control and tillage, nonlinear vibrations in agricultural tractors, and piglet pricing analysis. Readers will find useful tools for calculating the order, rules and theory behind complex phenomena observed in arable land.